Free registered delivery within Singapore on orders above S$80. Revitalising and moisturising cream with “Long Lasting” hydration and epidermal growth factor. 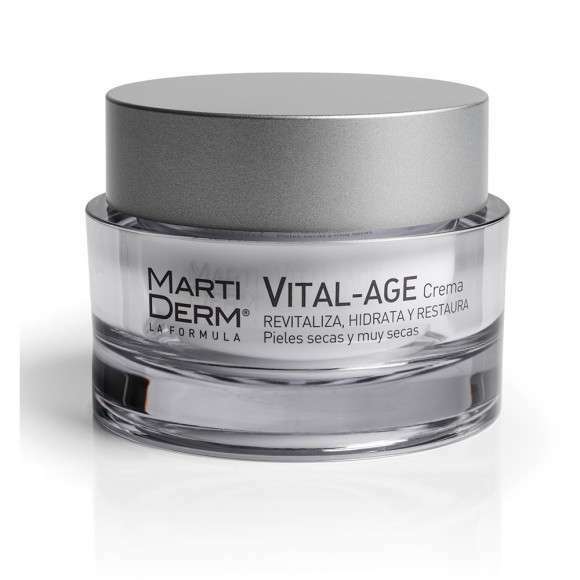 VITAL-AGE Cream adapts to suit each skin type for dry and very dry skin. Brightening effect with SPF15 physical sun filter. Revitalising Formula with Epidermal Growth Factor (EGF) and long-lasting moisturisation. Restores vitality to the skin, increasing the thickness of the epidermis, recovering skin elasticity and boosting repair. Deep, continuous moisturisation with visible effects 24 hours a day. Regulating effect on the skin’s moisture content. SPF 15 to protect against the sun and prevent the appearance of sun spots. MARTIDERM retains its founder’s values: rigor, effectiveness and quality in the formulation and production of its products; and transparency in the communication of their qualities and effects.